Georgian Oil Colour offer artists high performance colours at an economical and uniform price across all 57 colours in the range. 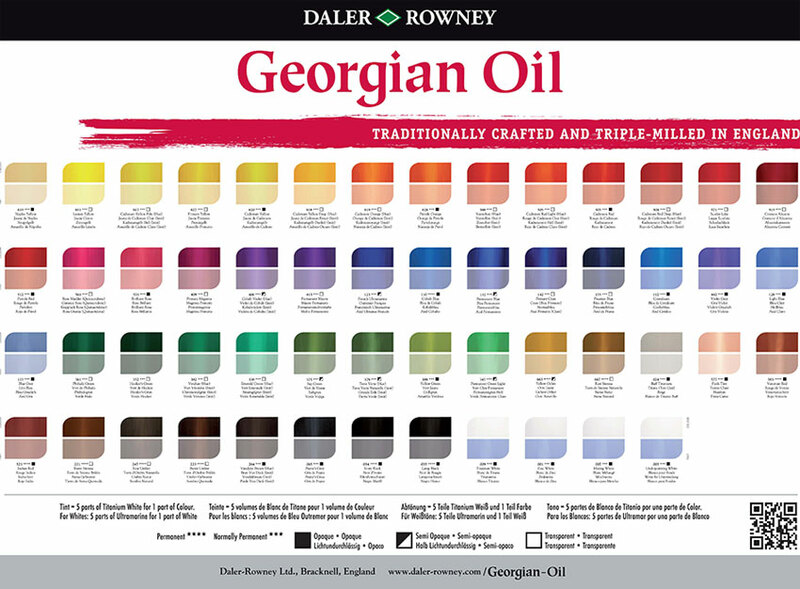 Georgian Oil Colours are produced to the same exacting standards as Artists' Oil Colour. Georgian Oil Colours are carefully blended and tested to produce the most brilliant colour, and match tint, and texture from batch to batch. All 57 colours have fine working qualities and a high degree of permanence. Highly opaque bright white with exceptional covering power for strong highlights. It can also be used for mixing and is a good all purpose white. Cool permanent white with lower reducing strength than other whites for greater control when blending to create more precise pale tints. Less opaque slower drying white, used in the later stages of a painting for subtle highlighting, glazing and blending with other colours to create pale tints. Exceptionally stable, highly opaque white specially formulated to resist cracking and shrinking in the early stages of a painting. The Old Masters �� White, based on lead pigment, suitable for all stages of a painting. It ��is a high performance milky white, noted for its opacity and durable paint film. When mixed with other colours it creates pure clean tints with minimum loss of tonal value. Classified as toxic according to EC legislation and available only in tins for EC countries.